But my opinions on the greatest stat isn't really what this is about. This is about giving players a way to discover and manipulate data themselves. I spend a lot of time delving into the API that Wargaming so kindly provides to us, and I like to think that gives me a certain perspective on things. This spreadsheet is designed to give that ability to you as well. With the upcoming third season of Clan Battles on our doorstep, I was hoping that this could help players understand a little better where they need to prepare themselves. The first thing one does is turn the sheet on, which is done in cell B1 by entering any clan tag. It doesn't matter if you're in that clan, as entering a clan tag simply turns the sheet on. You'll then be able to either type a name into cell C5 (make sure you spell it right) or select one of the members of that clan from the drop down menu there. You don't have to search for a player in that clan, but it does make it easier. From there the sheet will begin loading data. What you're able to manipulate is in the middle of the screen labeled "Stat Goals." The sheet comes preset with the above stat goals. 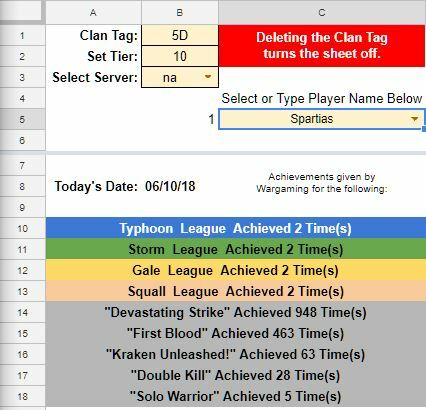 I've so far spent two seasons in clan wars at the Typhoon/Hurricane level. When I saw a player make an influential play, or just in general really helped their team, I took notice. I have based these stat goals on those players. Basically, if you want to play at the Typhoon or higher level, these are what you'll need to shoot for. My own clan uses an adapted version of this, and they disagree with me on the numbers. Disagreement is fine! We have a few players that successfully got their flags that theoretically wouldn't make it based on these numbers. The preset values are simply based upon my own observations. And I definitely observed that there is a wholesome correlation between a player's random battles statistics and their ability to perform in Clan Battles. Once you have your own copy of the sheet however, you can change these to whatever you like. These stat goals are quite important. For each one that you meet on a ship, you gain one "Qualifying Rank." Once you have met at least 4, you earn the basic descriptor "Qualified" for that ship. Exceeding the goals results in earning better descriptors on a ship. Working to earn better descriptors on a ship is kindof the entire point of the sheet. As you improve on a ship, you earn better descriptors! 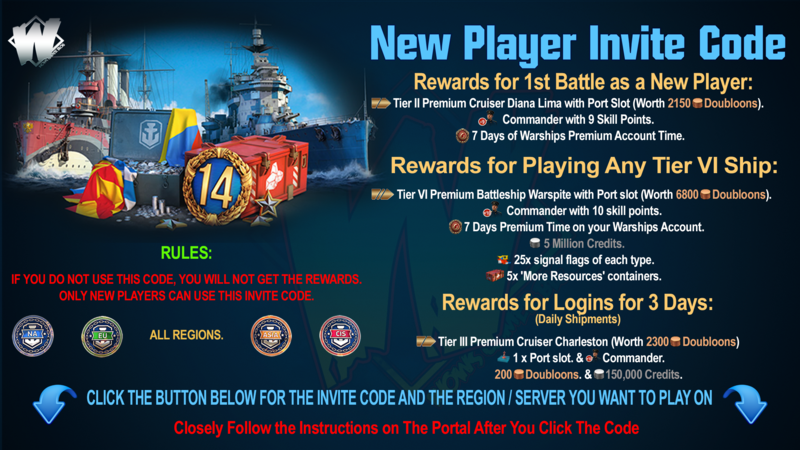 The sheet will not give you 4 qualifying ranks until you have at least 25 battles on a ship. But what about outlier ships? Ships that don't really fit the traditional dd, ca, bb, cv mold? By scrolling down below everything else, you'll see the section labeled "Individualized Stat Goals." If you set a ships' stat goals here, they'll override the more generalized versions above. The sheet comes preset with the Khaba already having individualized stat goals. Here's the kicker though. By looking below all of the individual ship results, you'll see a couple of nondescript areas (cells D80 and D82) labeled "Weighted Stat Goals" and "Weighted Player Averages." What if a player only has 2 battles on a ship, but they have 100% win rate etc? Should that be weighted as much as a ship that they have 100's of battles in? In this section the sheet takes all of the different ships, their goals, and weights them with their number of battles as the control. Those are my weighted stat goals. 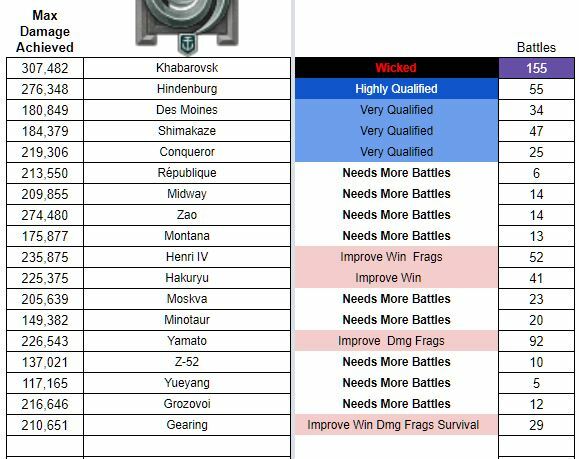 As you can see, I need to play more at t10, as my weighted stat goal for battles is in the red. I on average have too many t10's for how much I actually play at t10. However when I do play at t10, my other stats are all in the green. This section is best used to a quick glance to see if the player is overall actually performing at the level they should be or not. I can't take credit for this section though, the guys in OPG took the time to critique the sheet and they suggested it. They even took the time to explain the math to me! 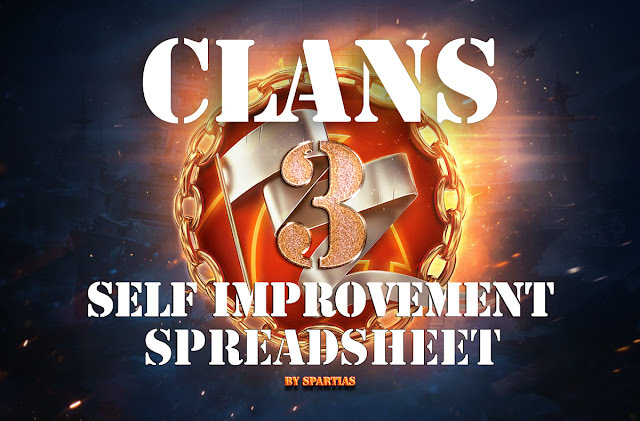 The sheet will also take the time to look up a series of achievements for a given player so that at a glance the user may see if they have any experience in Clan Battles. 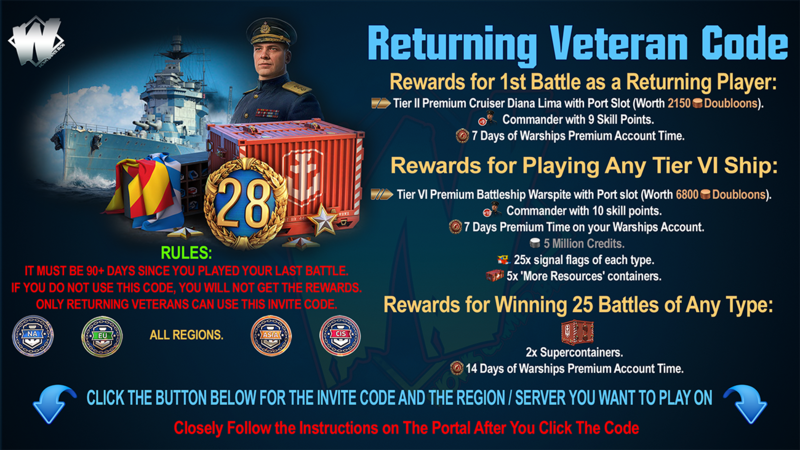 All it's really saying here is that they played in those leagues, but if I recall correctly you only have to play a few battles in a league to earn the achievement from Wargaming. You don't have to earn a Stalingrad flag to earn the Typhoon league Achievement. But it does serve as a quick reference on a new player to your group. Remember, this is simply a tool. However it is a tool designed for the user to set their own goals and rewards. I hope this is useful to players! If you would like a copy of this spreadsheet, Click Here. I have spent a lot of time looking for critiques on this latest piece of work. However it cannot ever truly be perfect. If you notice something is wrong, or something that could be improved, please let me know.